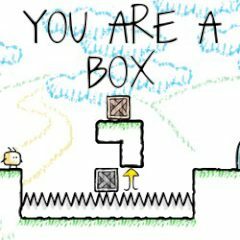 Move a box, collect power ups and make sure that the character will pass through all obstacles and reach the door in the end. Hurry up, don't waste a second on thinking! Have you ever played a game, where you were a box? This is not a joke, because in this game this is exactly the thing you are going to do! Use the arrow keys to move around and collect power ups to activate jumps or other abilities. Complete the level and don't lose your friend!